Sergio Ramos insists Real Madrid can catch Barcelona in the LaLiga table after a 3-1 derby win at Atletico Madrid moved his side up to second in the table. 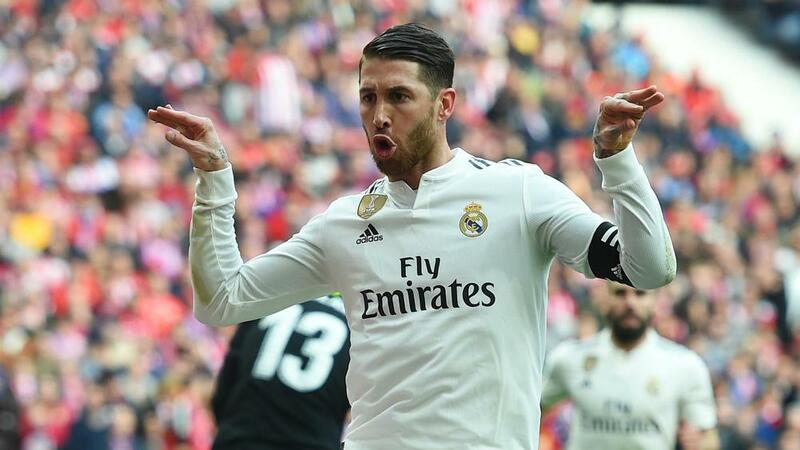 Ramos scored from the penalty spot in Saturday's victory at the Wanda Metropolitano, netting his 11th goal in all competitions this season, making 2018-19 the best scoring record of his career. Antoine Griezmann had cancelled out Casemiro's bicycle-kick opener before Ramos struck from 12 yards, with Gareth Bale's 100th Madrid goal wrapping up Madrid's first win at the Wanda. "The league is still to be contested," Ramos said to beIN SPORTS. "There are many points in play and any team can complicate your life as it was seen in the first round [of games]. "We have that hope and we will fight for the league and make it difficult for Barcelona even though they have a very important lead. "We put ourselves ahead of them in the table and we'll see how we go to May but now we're very good, with good feelings after the game against Barcelona. "We do not feel fatigue."